As a unique solution for Windows file server and PC users to password protect shared folder over Network, Shared Folder Protector cannot only protect shared folder with passwords but also assign access control permissions for up to 10 user groups. It offers Read only, Write only, Full Control modes and 15 types of access control permissions for users to customize. Hereby are explanations for the permissions the program provided. Users can visit "How to share folder with password on Network" first to learn the step by step guide of sharing a folder in Windows personal PC or file server. What is Shared Folder Protector? Shared Folder Protector is copy protection software for companies, academic institutions and other organizations. It enables users to share important data over network. 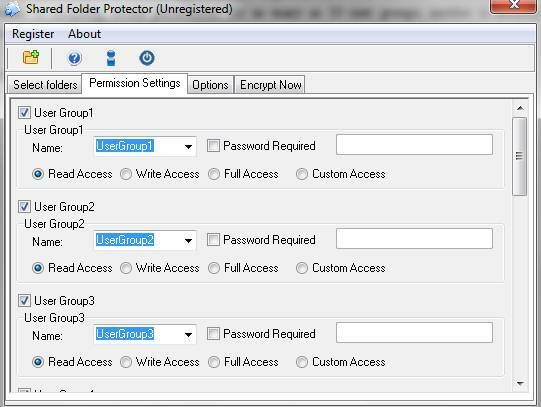 One of its unique feature is assigning access permissions for as many as 10 user groups; another is securely protecting shared folder and files with strong passwords. How to Set Access Permissions? 1. Run Shared Folder Protector. 2. Add the folder that need be shared. 3. Click Permission Settings tab on the main window. 4. Select a user group from the "Name" dropdown list and check the one of the four access modes: Read, Write, Full, Custom. 5. Check Custom Access for more permission options. When checking the Custom Access option, the Permissions window will pop up. Now users will find there are 15 types of permissions and some other settings. 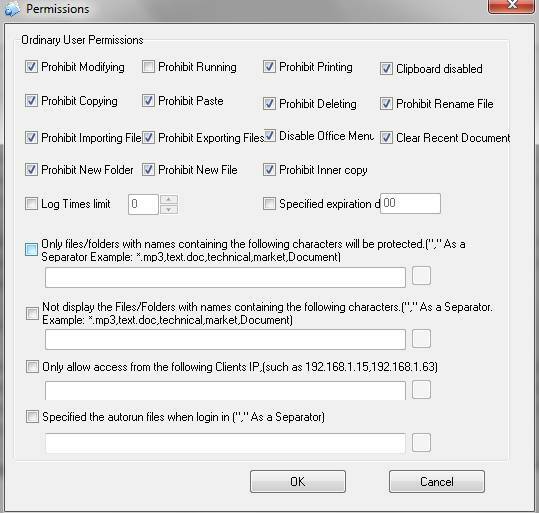 All permissions can be assigned and changed only by the Administrator. Users will get clear impressions of the access permissions Shared Folder Protector provides from the comparison table below.